PHE have just launched an interactive database for HCAI and AMR data from England using their ‘Fingertips’ platform. The HCAI data in the module has been available for years, but was buried in pretty dense Excel spreadsheets so tricky to visualise. The Fingertips platform makes data extraction and visualisation so easy even I can do it (example below). I recently posted an article on surprising finds of a study suggesting that horizontal transmission of C. difficile from known symptomatic cases may be less common that we thought. A group of researchers from Oxford, Brighton and London in the UK applied similar methodology to Staphylococcus aureus transmission with similar findings: only a fifth of S. aureus acquisitions could be attributed to patient-to-patient transmission. All patients admitted to a 16 bed ICU in Brighton were screened on admission and weekly to detect S. aureus colonization and acquisition. Each isolate was typed by spa and whole genome sequencing (WGS). The number of acquisitions that could be linked using conventional methods (spa typing combined with an analysis of overlapping stays) vs. WGS was evaluated. Overall, 185 (16.7%) of 1109 admissions carried S. aureus; 59 carried MRSA (5.3%). 680 patients were on the unit for long enough to have a weekly screen and hence were eligible for assessing acquisition. Of these, 44 S. aureus (22 MRSA) acquisitions were detected in 41 patients. 35 of these acquisitions were in patients who were screen-negative on admission and 9 were acquisitions of different strains in patients who were already colonized on admission. Only 14% (5/36) of the acquisitions available for typing were of the same spa type as another patient on the unit at the same time. All of these were MRSA. 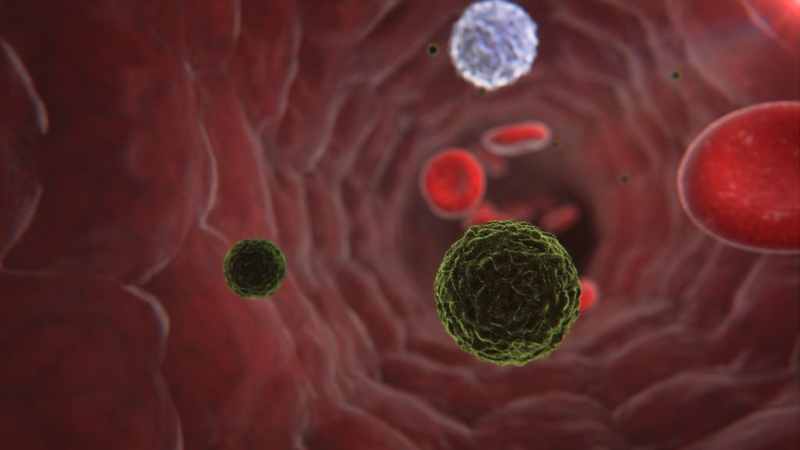 WGS discounted three of these apparent occurrences of patient-to-patient transmission, confirmed two and identified a further five (3 MRSA, 2 MSSA). So, in total, 7 / 36 (19%) of acquired isolates (5 MRSA and 2 MSSA) were linked to isolates from other patients (Figure). 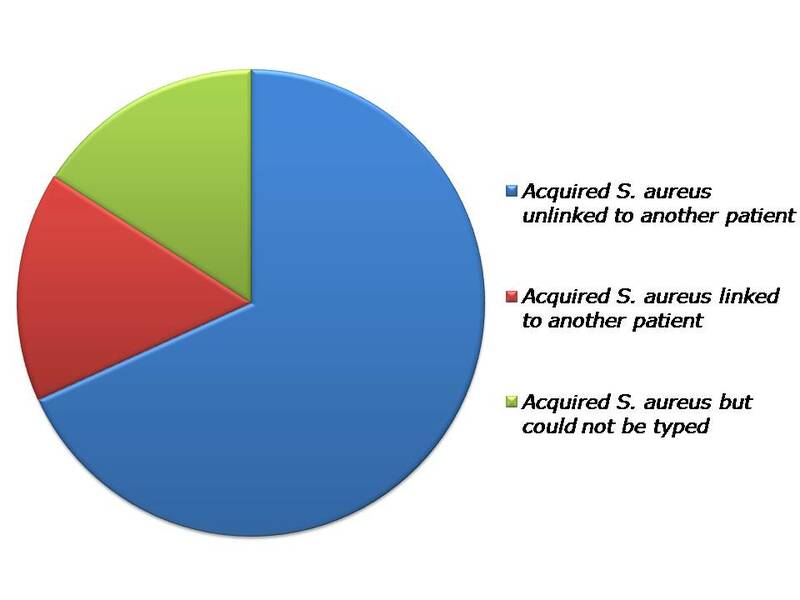 Figure: Source of S. aureus acquisitions identified through WGS. Principally, if almost 80% of patients did not acquire their S. aureus from other patients on the unit, where on earth did they acquire them from? In the C. difficile study, unrecognized importation of diverse strains from the community that would not be detected on admission since admission screening was not performed represents a plausible explanation for the surprisingly low incidence of horizontal transmission from known cases. This is not the case in this study, where all patients were screened on admission for S. aureus. So where were the diverse isolates acquired from? Staff carriers? Contaminated surfaces? S. aureus has the capacity to survive on surfaces for very long periods (more than 1 year), so an ancient environmental reservoir is possible. Furthermore, there was no ‘lead in’ period to the study, so it could be that S. aureus on the unit in the months before the study left an environmental reservoir that led to acquisition in some cases, which would not have been captured by this study. The fact that 4/7 patient-to-patient transmissions acquired the same strain of S. aureus without sharing time on the ICU together supports this, although could also be explained by staff carriers. It was a shame that 16% of the 329 S. aureus isolates (including 16% (7/44) of the acquired isolates) were not available for sequencing, which represents a substantial reservoir from which patient-to-patient transmission likely occurred in some cases. It was interesting that some 20% (9/44) acquisitions that were detected occurred in patients who were already colonized on admission; these would have been missed altogether if molecular typing was not performed. I wonder how much ‘silent’ acquisition of this type occurs? Assuming temporal relationship between strains assumes a constant mutation rate. The ‘speed of the mutation clock’ was assessed in this study through repeated sampling of the same patient. This exercise demonstrated minimal diversity, as was the case for C. difficile. WGS is rapidly becoming the gold standard for transmission mapping. In this study, the conventional approach of evaluating spa typing with overlapping stays lacked both sensitivity and specificity for identifying transmitted isolates. Article citation: Price JR, Golubchik T, Cole K, Wilson DJ, Crook DW, Thwaites GE, Bowden R, Walker AS, Peto TE, Paul J, Llewelyn MJ. Whole-genome sequencing shows that patient-to-patient transmission rarely accounts for acquisition of Staphylococcus aureus in an intensive care unit. Clin Infect Dis 2014. Jan 9. [Epub ahead of print].